Woods. Fields. Seashores. Parks. Suburbs. Cities. What? You wanted names and places? Routes, streets, longitudes, latitudes? That’s to be expected. But, sorry. The point of two-fisted bird watching is that you don’t do the expected. And you understand two things. Birds are anywhere. Rare ones will usually be in rarely visited places like Michigan’s Upper Peninsula. Or downtown Juneau. (There were so many bald eagles in Alaska’s capital that its trees looked like they were growing white apples). But, you might see a Pileated Woodpecker dart across a Chicago street. Just look. The two-fisted road is a lonesome road. Sit quietly in the woods. The birds will come. 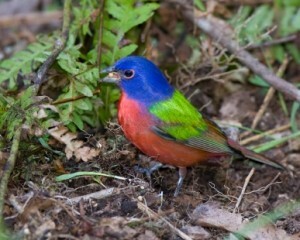 One day, a Painted Bunting will be looking you in the eye, a thousand miles from his home. Why? Because you were by yourself. Notice what happens when hikers approach. You hear them before you see them. Birds clam up. Snakes slide away. Woodchucks go underground. Deer evaporate. Bees stop buzzing. It’s just you and the chatty bird club. Nice folks. But not working the two-fisted side of the trail. You came to this page looking for tips. Not our thing. But a two-fisted birdwatcher can be big about it. We won’t leave you in the cold. There are countless sites offering advice and links. Here’s a good place to start, the big-daddy of birding blogs: www.10000birds.com. It’s kinda awesome, and we don’t use the word awesome, ever. But check out 10,000 birds and see. We’ve signed up for their daily e-blasts, and they’re more than teasers; they’re complete news pages with photos and solid writing. You might want to sign up, too. 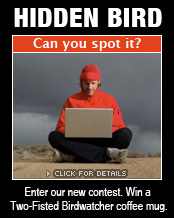 Here’s another great site to know: www.allaboutbirds.org. And it has its own links that can take you anywhere a serious birder would want to go. Another must-see site is North American Birders’ Forum. It’s got something for everyone, with informed discussions, rare bird sightings, links to cool websites, and a “listers central” with online records. For a great take on bird photography, a lot of terrific bird photos and even some bird-photo adventuring, click on www.BirdsInFocus.com. Also check out Birdfreak.com. This energetic site has a conservation focus, interesting ideas, good photography, and an extensive “blog roll” that connects you to anywhere in the bird blogosphere, including basic & popular blogs like Julie Zickefoose’s. These guys did their homework. To get an international perspective, look at Fatbirder.com out of the U.K. It’s got hundreds of pages and thousands of links about birding everywhere in the world. It’s even got jokes. For a hi-tech way to record sightings, learn about what other birders are seeing and join the giant conversation that the science community is having daily about birds, habitat, migrations, that kind of thing, try going to eBird. For even more information check the list below, provided here with our thanks to Peterson Field Guides and Houghton Miffllin Books, as well as the American Birding Association. We’re always keeping an eye out for more links, so check back often. Meanwhile, click away and have fun. Also new: “Daily Sightings,” a blog that takes you into the wild every day without leaving your computer."